The rock cycle is a model that illustrates where a mineral came from and what caused it to form. When Magma (molten rock) comes out of the earth through a volcano it cools and turns soild to form a rock called extrusive igneous rocks, all this happens in a process called crystallization. Then years pass by and the rocks are weathered to form sediment, then erosion transports and deposits the sediment in layers called strata or bed, then the sediment is compacted and cemented to for sedimentary rocks, the larger and heavier rocks settle first due to their weight. The process in which this happen is called lithification. 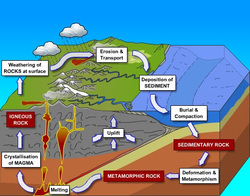 Then the sedimentary rocks are buried deep into the earth by moving plates and other geologic forces.Heat and pressure cause the sedimentary rocks to turn into metamorphic rocks. If the metamorphic rochs are pushed deeper into the earth the earth they melt, and the the cycle starts over again.